Two companies have recalled horse toys after two young children got the reins caught around their necks, the U.S. Consumer Product Safety Commission said. The children were freed by their parents and neither child was hurt. 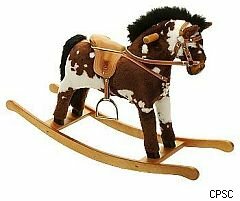 The CPSC said young children are in danger of strangulation from the reins on Big Ideas Marketing's Horse-on-a-Stick toy as well as three different style horses from Rocking Horse Depot. Consumers should immediately remove or cut the reins on all the recalled toys. The recalled Horse-on-a-Stick toy has a plush head with a fluffy mane and includes a bridle with reins. The horse's ears are embroidered with the words "press here" in red and makes neighing and galloping sounds. CPSC said it has a report of a 2-year-old boy who was almost strangled when the reins wrapped around his neck. The boy's mother freed him. About 8,800 Horse-on-a-Stick toys were sold for around $6 each at Love's Travel Stop and Country stores nationwide from May through July 2010. Consumers with questions can call Big Ideas Marketing of Owings Mills, Md., at (888) 908-8697 weekdays between 9 a.m. and 5 p.m. Eastern Time. The second recall includes Buckeye, Ariz.'s, Rocking Horse Depot's small, medium and large horses with bridles. Each horse has a hardwood frame, a synthetic hide and a fluffy mane and tail. Its saddle has a leather Rocking Horse Depot emblem on the right side. Those toys were sold on the company's website from November 2006 through December 2009 for between $105 and $185. The CPSC said it has a report of a 21-month-old girl getting the reins tangled about her neck. The toddler's parents freed her and she was unhurt. The company has a brief statement on its site that tells customers to cut or remove the reins. Consumers can call the company at (623) 302-6313 weekdays between 11 a.m. and 7 p.m. Eastern Time or visit the company's website.